The Address Residences ... unveiled. Eagle Hills Eagle Hills Bahrain, the developer of the urban waterfront project Marassi Al Bahrain at Diyar Al Muharraq, unveiled The Address Residences at the recent Gulf Property Show 2017 held in Bahrain. The Address Residences Marassi Al Bahrain includes the first Address Hotel outside the UAE, and Address Hotel Serviced apartments comprising a total of 155 serviced apartment units. The units will spread over two 10-storey towers connected through two levels of podium, and offer serviced one- to four-bedroom apartments, and penthouses with 199 parking spaces. All units will be offered on a freehold basis to all nationalities. 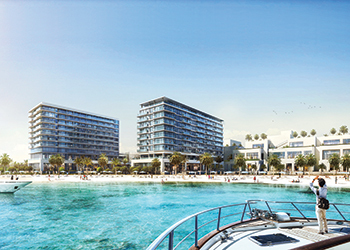 The Address will be integrated with a new 180,000-sq-m lifestyle shopping mall, Marassi Galleria – the largest of its kind in Bahrain – featuring private residential facilities and a world-class waterfront boardwalk promenade, and direct access to a private beach. Overall, he said, Marassi Al Bahrain will add significantly to Bahrain’s touristic offering. Perkins & Will is the architect and HOK is the interior designer of The Address, with Chris Blandford Associates appointed as the landscape consultant. Speaking to Gulf Construction, Mammond said the contract for infrastructure works of Phase One of Marassi Al Bahrain has been awarded to Haji Hassan and is under way. Nass Contracting is responsible for the construction of Marassi Residences. Keller has installed 4,000 piles for the Marassi Residences, Vida Residences and Marassi Galleria. The main contract for the mall and hotels will be awarded within the next three months. The first residential building is set to finish in Q3 of 2018, while works start in Q2 of this year on the Galleria Mall, Vida Hotel and Address Hotel with a completion target of 30 months after commencement of work. The total value of Phase One is more than $1.5 billion and completion has been set for 2019. A number of development projects were progressing on the site, including Marassi Shores, Marassi Residences and Marassi Boulevard.